Ackermann’s Repository of Arts, January 1817. 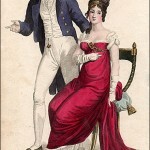 This dress is labeled as Full Dress, meaning a very formal evening dress. But it almost looks like a French court dress, especially the open robe with a short train. 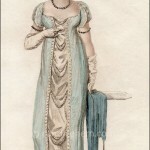 Since the description indicates it is based on a French model, perhaps it was in fact a modified court dress. In any case, it looks like a Very Important Dress, ie one that would have been worn, if not at court, at perhaps a reception or dinner at which royalty was present. It would also make a lovely wedding dress, don’t you think? “A white soft satin slip, tastefully ornamented at bottom with a flounce of broad blond lace, and a light roll of light satin, surmounted by a wreath of lilies composed of plain blond, and a second roll of satin. The stalks of the lilies are composed of white silk cord, and a row of the same, disposed in waves, is placed above the roll of satin. Nothing can be more beautiful than this trimming. 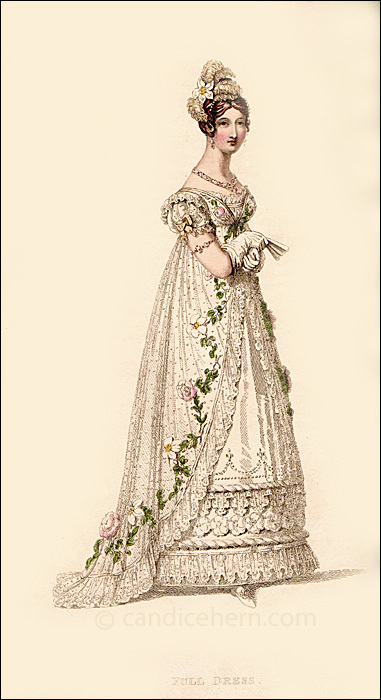 The gown, composed of spotted British net, is an open robe, with a short train, which meets in front, but slopes gradually off towards the bottom, so as to display the trimming of the slip. The robe is ornamented with a flounce of blond lace to correspond with the slip, and a wreath of intermingled lilies and roses. We refer our readers to our print for the body of the dress, which is tasteful and very novel. 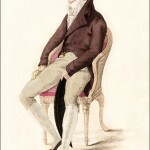 The sleeve is short and very full; a single flounce of blond is so disposed a to form an uncommonly pretty half-sleeve. The hair is brought up in a high tuft behind, and the front hair is combed back on each side so as to display the forehead; a part of it is disposed in loose ringlets, which fall carelessly over the ears, which they partly shade. The hair is ornamented by a single lily, placed in a bunch of fern. Necklace, ear-rings, bracelets, and armlets, of ruby intermixed with pearl. White kid gloves, and white satin slippers. Plain small ivory fan.